The Jaghund is a sinuous grey or reddish furred quadrapedal hunter with a serpentine body, slick pelt, and exceptional intelligence. Sharing some features with Otters, these predators are found along the coasts and large lakes of Aeldos, and known for their intellect, aquatic hunting prowess, and playful, amphibious nature. Jaghunds can grow up to 2 meters long and can be found on some ships and in coastal towns, acting as scouts and guardians both in and out of the water. An abberrant creation with an unknown origin, many naturalists believe the Jaghund was created by the Silent Engineers or the Shifters of the Urul Imperium. Others argue that the species was the result of cooperation by both factions. Still others identify the Jaghund as ‘Divinare’, creations of the Ayr. The answer to this question is unclear and the Jaghund remains difficult to classify. Despite its name by most accounts the closest classified relative species are members of the Lutrinae subfamily, in particular Otters, however Jaghunds are considerably larger and better adapted for terrestiral life than their potential cousins. The Jaghund possess powerful webbed feet for swimming, and a long, muscular fringed tail used for balance on land and steering in water. With facial features somewhere between a cat and an otter, they have small eyes and limited vision but large ears and nose and excellent hearing and olfaction. Jaghund are comfortable in a wide range of temperatures. They have a hearty appetite and in the wild spend a significant portion of their lives hunting for food, particularly aquatic reptiles, fish, and crab but also a variety of nuts, terrestrial and aquatic fruits and the occaisional small pig or deer. Jaghund defenses include incredible speed, intelligence, sharp teeth, powerful jaws, venomous claws, and a tail whip that can break bone. Some older Jaghunds develop a set of hard calcified facial plates that protect them against blows to the head. The trigger for this mutation is unclear. In the wild Jaghund are semi-social creatures, spending their early lives in families of 2-5. They are curious and will approach other non-threatening species readily, though they seem to have a keen sense for deception. They are otherwise reclusive, tending to prefer isolated habitats in riverine or oceanic regions. They are often found near or within coastal ruins of the Urul Imperium, often nesting in difficult to access submerged portions of said ruins. This lends further credence to theories suggesting an Urul origin for the species. 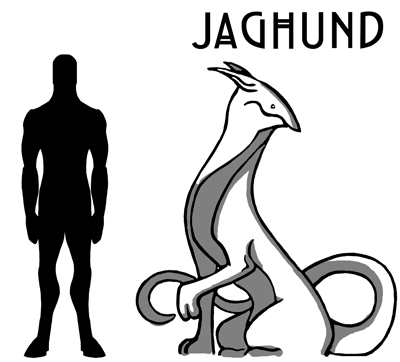 Jaghund who have been raised from infancy among humans are functionally domesticated, though they are intolerant of abuse and will turn on humans if intentionally harmed. They are intelligent enough to be trainable but willful enough to be stubborn in the face of tasks they don’t enjoy. The species’ exceptional intelligence, bordering on sapient and sometimes compared to the Faeles of Selene, is a well known trait. In the wild they demonstrate complex problem solving skills, long memories, remarkable awareness, and even limited tool use. With training they are able to acquire an understanding of a large human vocabulary and are highly responsive, though not able to actually speak. These traits have made them excellent guard and service animals but is countered somewhat by their strong sense of independence and mischief. Regardless, a socialized Jaghund can be exceedingly loyal. In Victra Jaghund are sometimes hunted for their pelts which are highly valued by various aristocratic groups. The species is dangerous enough and useful enough in other ways that most communities choose other prey, but it is not unheard of. Conversely folk religion in eastern Svertheim attributes a divine nature to the species, making it taboo to kill. Most human encounters with Jaghund are benign and fleeting, driven by curiosity on both sides. There are no records of Jaghund actively hunting humans and hostile encounters are entirely driven by human aggression. This is used as evidence of a human origin for the species. Jaghund life spans can extend up to several centuries barring accident or predation. This is considered a key piece of evidence for a non-natural evolution; few other species demonstrate such extended life spans. While Jaghund are skilled predators they are not apex predators. They are adept at avoiding predation but large aquatic and terrestrial apex predators have been observed to hunt and eat Jaghund. Jaghund venom is not lethal to humans but it is incredibly painful and debilitating.